Mity Lite CRTCT42-72BLK26 - Easy Transportation and Storage! This rolling table cart fits round tables up to 72 inches in diameter. The wide stacking cart fits up to 12 folding tables in edge stacking formation. 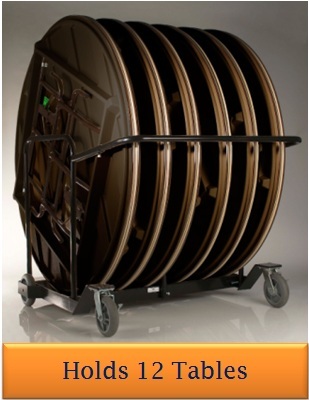 Now you can safely and easily store and transport up to twelve 72" round tables at a time with the CT Table Storage Cart Wide from Mity-Lite. With a frame that's made of sturdy steel and casters and wheels that have a dynamic load capacity of at least 450 lbs. each, this cart will last you for a long, long time. It also comes with loading ramp covered with neoprene rubber that will protect the edges of you tables from wear and tear so you can have tables that look new for a long time. Looking for a narrower cart? Try the Mity-Lite CT Table Storage Cart Narrow. Handle provided at the rear of the cart that will accommodate tables from 42" to 72"
Competitive Edge Products, Inc. is an authorized retailer of the Mity-Lite CT Table Storage Cart Wide. Q: Is this difficult to move around with it full of tables? A: It's actually quite simple. The soft pastors are actually quite large making it easy to move around and there is a handle so the average adult could move these around from room to room. Shipping: Shipping on orders for the Mity Lite CARTW vary by state, call for details. Delivery Details: This product generally ships directly from the warehouse in Orem, UT. This item generally ships via a curbside delivery through an LTL carrier (too big for UPS and FedEx). The customer must be present to sign for the order. The freight carrier is instructed to contact you prior to delivery to set up a delivery appointment. Local Pickup Option: This item may be available for local pickup in Orem, UT. If you are interested in picking it up locally contact our customer service for a super cheap pickup quote at 866-308-5484. Dimensions: 60" x 52" x 13"